Our fizzy mani-bombs are handmade freshly every week to avoid harsh chemicals and preservatives. We dispose of all nail files, buffers and sterilize all implements in a hospital-grade autoclave. This is our signature manicure. Our handmade mani-bomb will fizz in water and release moisturizing oil and natural deodorizer that detoxifies and soothes tired hands. Also, it includes lime & lemon soak for antibacterial. 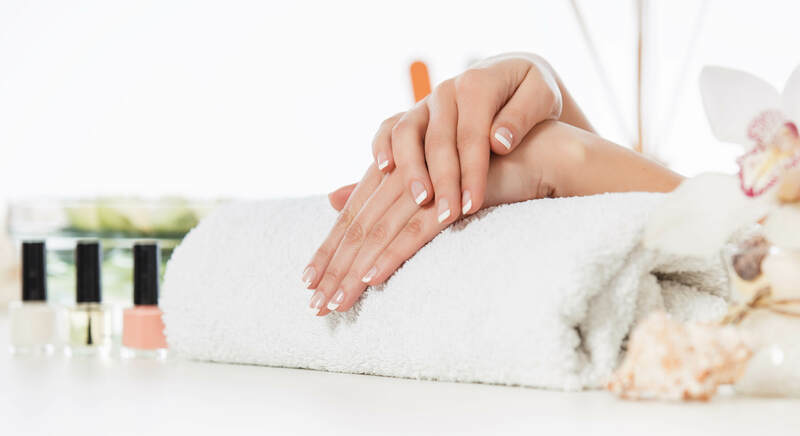 We will trim your cuticles & nails, and finish with a relaxing hands, neck & shoulder massage. Nails are finished with a polish color of your choice. SNS dipping powder is an alternative to gels and acrylics. It has vitamins: A, E, D3, and B5, plus calcium for stronger, healthier and thicker nails. SNS dipping powder requires no UV/LED light and dry almost instantly! Manicure included. This service includes our signature "Mani-bomb" with 15 minutes of massage and hot stones for your hands, neck & shoulders. This is finished with one of our longer lasting hybrid color. Hands are inserted into individual and disposable heated paraffin-filled mitts. Paraffin wax treatment contains nourishments with Swiss Apple Stem Cell, a proven ingredient for age-reducing support for hydration and protection. It will soften your skin and remove dead skins for smoother hands. Also, it will soothe and heal dry and cracked skin. Mani-bomb included. This clay-based mask deeply nourishes while drawing out impurities which can rob us of radiant, healthy-looking skin. Formulated with certified organic ingredients and healthy cucumber extract, shea butter and olive oil. This product is a superior hydrator. This service included our signature "Mani-Bomb”. Includes Mani-Bomb followed by individually candy-wrapped scrubs to remove dull flaky skin. It contains a delicate blend of salt and sugar crystals, vitamin E, macadamia nut, avocado, sweet almonds oil, cocoa, and shea butter to exfoliate, moisturizes and protects your skin.